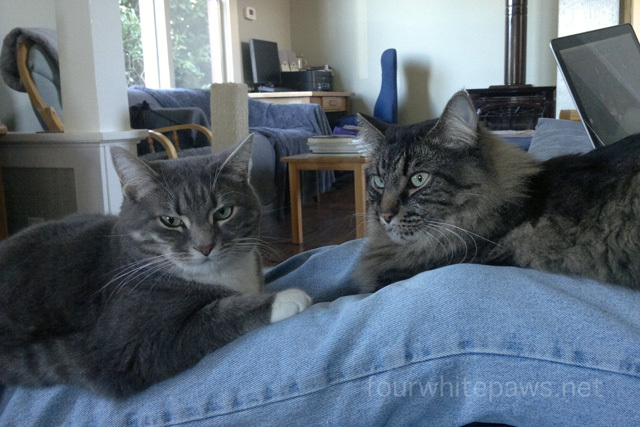 fourwhitepaws: Willow & Nahum's gotcha day! People think our cats are lucky to have us but we know that we are lucky to have them! 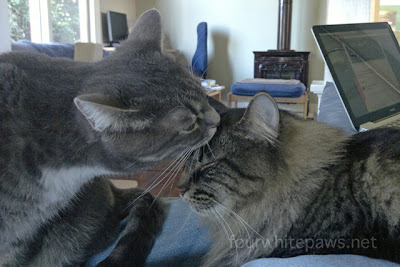 Happy Gotcha Day to both Nahum & Willow. How sweet their friendship is. I'm so glad they have each other and you! Great pics! Happy Gotcha Day indeed. So much life and beauty to celebrate. I can see that I have a kindred spirit in you Cat Guy. Thanks for being such a caring soul. I think Trish's hubby is just getting his Etsy shop going--it's been only a few weeks, since the latter part of April. I hope he'll be adding more things, but I don't know that he wants to focus on pets. You're all a set. All equally lucky to have the other. Nice. They are so sweet together. I like seeing them take acre of each other. Happy gotcha day to all at Four White Paws. A very happy Gotcha Day to two very sweet kitties! pee ess: Mommy is looking into pet blankets, etc, for the tie-dye shop! We hope to have more items in about a month. Thanks for looking! Happy, Happy, Happy Gotcha day you two!!!!!! Happy Gotcha Day to the both of you. You both love your mommy and daddy I know, and you know that the love you have for them is all the thanks there is in the world..not that they ever needed thanks. Their hearts are too sweet to need thanks for having you in the fur family. I love how much they love each other... so precious!